Due to its proximity to Koh Lipe, many locals and tourists prefer to travel by ferry from Langkawi to Koh Lipe. At BusOnlineTicket.com, Bundhaya Speed Boat and Telaga Terminal are the two popular ferry operators providing the ferry for this route. Bundhaya Speed Boat has been providing ferry service since 2008 while Telaga Terminal has been operating since 2005. Hence, both ferry operators are very experienced in their field. The ticket price for ferry from Langkawi to Koh Lipe is around RM 110.00 to RM 128.00. Bundhaya Speed Boat and Telaga Terminal each offers two trips available for online booking daily. Bundhaya Speed Boat ferry departs at 9.00AM and 2.00PM while Telaga Terminal ferry departs at 9.30AM and 2.30PM. The trip duration for ferry from Langkawi to Koh Lipe takes around 1.5 hours. 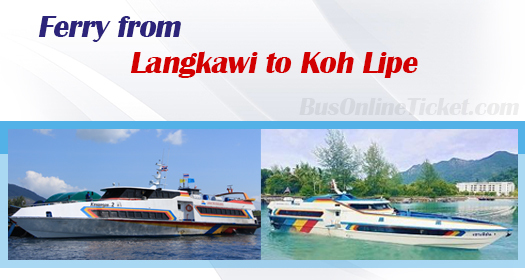 There are two pickup points in Langkawi for Langkawi to Koh Lipe ferry. Bundhaya Speed Boat picks up passengers from the main ferry terminal in Langkawi, which is in Kuah Jetty. Meanwhile, Telaga Terminal ferry picks up passengers from Telaga Harbour International Terminal located in Pantai Kok. The location of Telaga Harbour International Terminal is around 30-35 minutes driving distance away from Kuah Jetty. On the other hand, it is only around 15-20 minutes driving distance away from the airport. As for the drop off point, please note that there is no jetty in Koh Lipe. Instead, you will have to transfer to a long-tail boat upon reaching Koh Lipe. The fee for the long-tail boat service is 50 baht. For Telaga Terminal ferry, this 50 baht fee is included in their ferry ticket price from Langkawi to Koh Lipe. The long-tai boat will take you to Pattaya Beach for immigration. Going to Thailand from Malaysia, you need to go through the customs and immigration in both countries. In Langkawi, the immigration office is in both Kuah Jetty and Telaga Harbour International Terminal. Therefore, please arrive to the departure point early at least 1 hour and 30 minutes before the departure time. In Koh Lipe, the Thailand immigration office is located in Pattaya Beach beside the Bundhaya Resort. For those who come from the countries listed in the Tourist Visa Exemption Scheme can enter Thailand without visa for 15 days. Malaysia and Singapore are included in the list. Apart from that, only some countries are eligible to apply for Visa on Arrival (VOA) in Koh Lipe. Therefore, please make sure you are prepared for the immigration before your ferry departure.